THE WINNING SEQUENCE: (Top left) With his team trailing by a point, Atascocita's Carsen Edwards (3) puts up an 18-footer that misses. (Top right) Teammate Brandon Loville (1) follows up with a 10-foot push shot that wins the game and the Division 1 Gold title. (Below) Loville celebrates with teammates Greg Shead (10) and Paris Marques (5). For the first time in nine years, the two most prized McDonald’s Texas Invitational trophies won’t be traveling far outside the vicinity of Phillips Field House. The Atascocita boys and the North Shore girls ended the tag-team dominance of Metroplex schools on Saturday by claiming Division 1 Gold championships with a pair of sizzling title-game victories. Atascocita’s Brandon Loville nailed a follow shot from 10 feet out at the buzzer to lift his team to a 51-50 victory over tournament behemoth DeSoto in the boys championship game. In the preceding girls title game, North Shore trailed Cy-Woods nearly the entire contest before storming back in the final three minutes for a 57-54 victory. A three-pointer by Chasity Patterson with 1:11 to play gave the Lady Mustangs a 55-54 lead and wiped out a Cy-Woods advantage that had held steady at around five points most of the game. Patterson added two free throws with 12 seconds left to account for the final score. North Shore prevailed by outscoring Cy-Woods 7-0 over the final three minutes of the contest. The twin trophies for Houston area teams marked a sudden switch from recent tournament history. All six of the boys and girls titles earned the past three years had gone to three Metroplex schools – DeSoto, Duncanville and Flower Mound Marcus. Over the past eight years, 11 of the 16 boys and girls crowns had headed to North Texas. The Atascocita-North Shore coup marked the first Houston-area sweep since 2005, when Kingwood won the boys title and Clear Brook the girls championship. Atascocita also prevented DeSoto from becoming the first boys team to repeat as champion since Kingwood went back-to-back in 2005-06. Meanwhile, several Pasadena ISD schools, all competing in Division 2, came away from the tournament with something to smile about. Four Pasadena ISD boys teams emerged with winning records, led by 4-1 Rayburn, which won the consolation trophy in Division 2 Gold with a 76-74 victory over La Porte on Saturday. South Houston finished 3-2, taking third place in Division 2 Silver with a 59-36 rout of Deer Park, the Trojans’ second victory over the Deer in just six days. Dobie also finished 3-2, making it to the championship game in Division 2 Silver before falling to Langham Creek, 43-29. Pasadena ISD girls teams had a rougher go of it, although Dobie did manage a 4-1 mark and wasn’t derailed until Saturday morning’s semifinals in Division 2 Gold. The Lady Longhorns fell to San Antonio Madison, 49-28, but rebounded in the afternoon to beat El Paso Eastwood, 52-38, and take third place. Few Texas Invitational title games have offered a finish comparable to the Atascocita-DeSoto slugfest. Atascocita led 29-23 at halftime before going on a nine-point run to start the second half. Trailing at one stage by 14, DeSoto finally found a few cracks in Atascocita’s delay game. With just 90 seconds left, Atascocita found itself clinging to a 49-46 lead -- and by just a one-point margin at the one-minute mark. DeSoto got the ball back on a turnover, and with 25 seconds left, guard Julian Miranda found center Marques Bolden with a behind-the-head pass as he drove toward the baseline. Bolden caught the ball and jammed it home to give DeSoto a 50-49 lead. With his team on the ropes, Atascocita guard Carsen Edwards put up an 18-foot shot with only four seconds left. It missed, but Loville got the rebound from 10 feet out in front of the basket. He leaned in, gave the ball a push and it went in – winning the game and the championship for Atascocita. Loville, who scored 10 in the contest, was named the tournament’s outstanding player. Edwards finished with a team-high 15 points. Bolden led all scorers with 21, while teammate Tahjon Starks added 11. 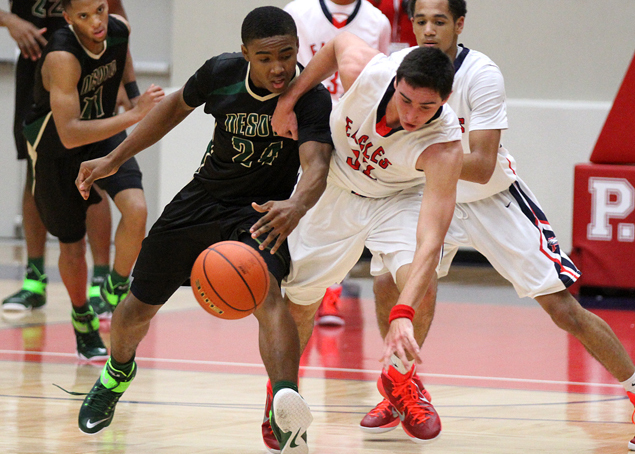 DeSoto's Tahjon Starks (24) and Atascocita's Matt Willrodt (32) battle for the ball near midcourt. Atascocita's Carsen Edwards runs free of DeSoto's Starks as he presses the ball up the court. Loville works the ball against DeSoto's Edric Dennis as his coach, David Martinez, shouts instructions from the bench. DeSoto's Bolden at work on defense: (Left) He swats at a shot by Edwards; (right) he tries to deflect a short bank shot. Atascocita's Paris Marques (5) plays keep-away under pressure from DeSoto's Julian Miranda. Atascocita Coach David Martinez lays down the law with his players turning a timeout. Atascocita's Loville is presented with the Scott Talton MVP Award by Talton's widow, Vicki Talton (right), and her son, Scott Talton Jr. (left). North Shore's Adriana Jackson demonstrates the art of the no-look pass. Nancy Mulkey, Cy-Woods 6-foot-9 junior, walks away from the confrontation after drawing a foul inside. Cy-Woods guard Tatyana Perez (11) dribbles toward the baseline as North Shore's Chasity Patterson defends. (Left) Cy-Woods's Mulkey puts up a shot over North Shore's Alyssa Okoene; (right) Erica Ogwumike launches a shot for Cy-Woods. North Shore's Kayla Mack breaks toward the basket and two points as her teammates jump up to celebrate.